The world is a scary place sometimes. This world is a sad place this week. After spending November 11 thinking about the sacrifices people have made to keep peace, the rest of the week was full of terror and sadness - Beirut, Baghdad, Paris, Japan, Mexico. Terror brings out the worst in everyone. I'm going to repost my (slightly improved, without character limit) diatribe from Twitter last night, and that will be the last thing I say on this matter. So many people are willing to cry ‪#‎notallmen‬ and ‪#‎notallwhitepeople‬ but are okay with lumping Muslims into one group. Please actually explain to me how that makes any sense. Please explain how an entire group of people are responsible for the actions of few. No one wants to be judged by the bad apples of their bunch. Holding 1.6 BILLION people accountable for the actions of maybe 1000 total is wrong. There were 7 people involved in the attacks in Paris - there is no way to tell if any of those people were Muslim. One may have been Syrian, and one was a French national. That is all we know. If that's the case, white people, we are fucked. We have to be held to genocidal standards. Meaning the enslaving of entire peoples is on us. Most of the fighting and unrest is because of us, because of colonialism and us believing that our race, our culture was better and more worthy. We do not have the right to treat other groups like sociopaths, because look at what our ancestors did. At what we wrought. I don't like being told that I am responsible for what my ancestors have caused. Instead, I try and be better than them and do better. I abhor racism - I will not stand for it, I will call it out, I will fight against it - because it makes no sense to judge someone based on the colour of their skin as opposed to their actions. If we all judge people by their actions as being a part of the colour of their skin, all white people would be neo nazis or anarchists as most of the terrorism in this world has been perpetuated by white nationalists or political dissidents. 23% of humanity is Muslim, most of them being from Indonesia. Let's not judge them for the .01% of them that are rotten. Being Muslim now is like being Jewish in the 1930's or Irish in the 1900's (or 1960's-90's UK), or the Romani people pretty much always. Why do we need a cultural group to try and marginalize? Why do we need to allow racism control us and drives us to disenfranchise so many people? Why do we need to allow the actions of a few dictate a generalization of the whole? Let's be better than racism. We need to be better. Be more compassionate. Be more accepting. Be less prejudiced. Stop letting ourselves be controlled by fear. Let's stop blaming 23% of humanity for the actions of 6 or 7 people tonight, actions that almost all of that 23% abhor and disavow. Let's work on building an understanding, because you cannot fight hate with more hate. When we live in fear, we live with hatred, and the terrorists win. It is easy to hate, it is easy to be racist, and to let distrust drive you. Do the difficult thing - be better. To quote a great philosopher: "Be excellent to one another." Be better than the hatred, be better than the fear. We are all human beings, try and remember that. Mes ancêtres sont venus de France, il ya 400 ans à la recherche d'une nouvelle vie. Ils étaient des immigrants. Ensuite, ils se sont déplacés à cause de la guerre. Les réfugiés ne sont pas le problème. Les extrémistes sont. Placer le blâme là où il appartient. Les réfugiés qui fuient les extrémistes. Ce qui rend mes ancêtres français mieux que les réfugiés syriens? Rien. Ils voulaient tous sécurité et le bonheur loin de la guerre. Je me tiens avec Paris, Baghdad, Beirut. Je me tiens à la justice. Je suis contre le racisme et le profilage. (My ancestors came here from France 400 years ago searching for a new life. They were immigrants. Then they were displaced because of war. Refugees are not the problem. The extremists are. Place the blame where it belongs. The refugees are fleeing the extremists. What makes my French ancestors better than the Syrian refugees? Nothing. They both wanted security and happiness away from war. October has been a strange, strange month. It has been a month of incredible ups and downs. Firstly, I had a lovely vacation back on my island home. It was lovely to see the people we did. It was relaxing. On the flip side, lots of changes happening in my life. Nothing I can really get into, as the people involved have not announced things publicly, but it's got me feeling mixed up inside. Happy, but very very sad. It is the culmination of that Death card popping up, and it makes life a little more dim. All things said, I feel like taking some time off was a great thing. It gave me time to deal with things, gave me time to feel things (which is so important, guys. So many people don't allow themselves to just feel how they feel, good or bad. It can make all the difference. ), and in the end, was a good thing. I go back to my day job (hopefully temporarily) on Monday with trepidation. This past weekend has been a flurry of activity. Hal-Con has been on, and we've gone for the past few days. I'm usually not great with crowds, but I felt like no point was exceptionally crazy. I had a few instances of there being just too many people, but I got over it and moved on quickly without incident. I am not a crowd person, and I'm pretty introverted. I spent 10 hours there on Friday and 8 today. I'm supposed to go tomorrow too, I got the weekend pass, but I am feeling utterly wiped by just being there that I don't know if I can muster it. It is super fun and worth the cost, but I may just need some quiet time tomorrow. Tonight, on Samhain, my coven went to the public ritual that was being held. My city has had one since 1997 - some have been phenomenal, some have been just okay, and some have been absolutely wretched. The gentleman who usually runs them does a great job - he's had some off years, and some fantastic years. I have not been to a public event in about 4 years (because the community is full of racists and cowards who shelter them), but we thought tonight might be fun. It was an amazingly good time! We danced, we sang, we offered to our loved ones, to the gods. We scared a few normal onlookers (I heard one man say to another 'let's get out of here quickly'). We drew a crowd of onlookers. I got to light stuff on fire and wave it around. The drummers was phenomenal. It was a great crowd. We came home after, I made the traditional cider (though maybe with a bit of spiced rum this year! ), we ate a meal and drank together. As the coven drifted off into the night and I was left alone with my time, I set out offerings of mead, tobacco, and wine for my gods and ancestors. I lit candles and sang their praises. I burned sweet offerings to them. I then asked for their guidance, and shuffled my tarot cards, asking for guidance on the next year. Tonight brought me the Emperor, asking me to take a leadership role in my own life and my future; and the Page of Cups, asking me to be more open and self-loving about the process and to others. I need to build a strong relationship with my future, and be structured and diligent about maintaining. As I wait for my candles to burn low, I thank my ancestors and gods and spirits. I drink deeply of their knowledge and experience, and seek to learn what I can from them. As the clocks tick back an extra hour tonight, I am rejoicing in an extra hour of sleep. I grow more and more tired as the minutes tick on, so now seems the time to pour myself into bed to awake to a new month with new possibilities. 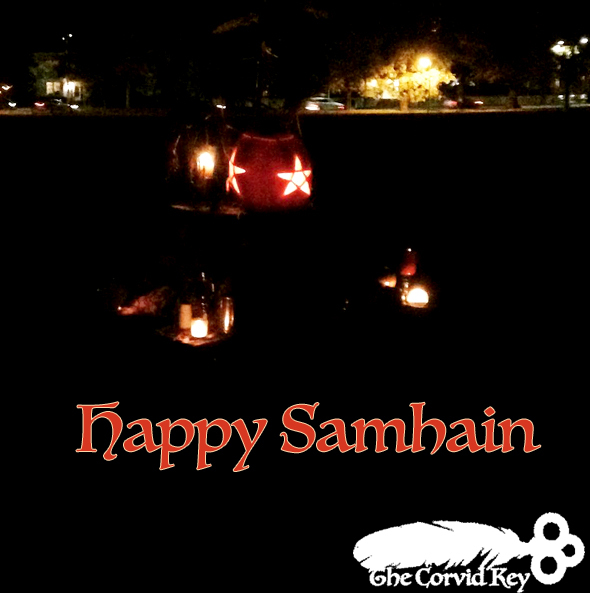 Mischievous Samhain blessings to you (and holler at my Beltane readers in the land down under!). Dream of your loved ones tonight.